From scope to close-out, the most successful projects integrate safety from the very beginning with a focus on incident prevention through planning, communication and defined safety activities for everyone involved. Caterpillar has developed a workshop specifically for executives, project leaders / managers, engineers and business development managers who want to optimize results by minimizing risk at all phases of the project. Join this event to preview the workshop material, meet the presenter and decide if your team could benefit from an interactive discussion about how to drive safety engagement and accountability in business development, field mobilization, operations evaluation and turnover. In a culture of safety excellence, all employees from the president to the frontline worker “own” safety by way of clearly defined accountabilities and the authority to speak up with ideas or concerns. In this sense, everyone is a “safety professional.” What does this mean for the safety department and its staff of experts who have traditionally been held responsible for safety results? To move from traditional to world class safety management, many organizations realize a need to redefine the safety professional role. Join this event to learn how the most successful organizations are engaging these valued resources to advance their journey to zero. In both work and life, fatigue is inevitable. It cannot be eliminated, so the risk of fatigue hindering safety is ever present. However, with some proven tools, processes and commitment, fatigue risk can be managed in the workplace and at home. Join Todd Dawson for the third and final webinar in the Workplace Fatigue series: Managing the Risk. Through case study examples, you will learn some practical risk reduction tactics and discover successful, and unsuccessful, approaches to fatigue management. As a special bonus, Dawson will share the tools Caterpillar customers are using to limit the impact of fatigue in their operations, and take your questions about how to deploy them in your organization. Once you recognize fatigue as an inevitable force of nature, the next step is measuring its impact on your employees so you can mitigate and manage the risk. There are 5 Essential Questions of Fatigue Risk Management to consider when developing or improving your defenses against this unavoidable threat. This presentation will focus on the question of quality and quantity of sleep. Using fatigue evaluation tools to “see” employee sleep data gives you the power to optimize schedules, deliver education and training and reinforce all the layers of fatigue risk protection around your workforce. Safety technologies are providing unprecedented visibility to risk, but technology alone will not protect employees closest to hazards. Sustainable safety excellence requires layers of protection that include technology, training and education, policies and procedures and an overall culture that values safety equally to productivity. Even the most sophisticated technologies will fail to meet objectives if implemented within an operation that incentives risk. Learn how to develop a safety system that leverages technology to build a culture of safety excellence. As knowledge of fatigue risk increases, so too does the responsibility to intervene. Recognising fatigue and understanding how to mitigate it are two very different skills. Join Asia Pacific Consulting Manager Brett Haskins as he answers the burning fatigue mitigation question: ‘where do I start?’ by examining some risk mitigation tools for immediate implementation. Highlighting stories from the field and recommendations from fatigue science experts, this webinar explores the manner in which fatigue and the associated stigma have been mitigated in various workplaces around the globe. Learn how to start a conversation about fatigue mitigation in your organisation. Mining companies around the globe are using wearable and in-cab technology to see, mitigate and manage fatigue risk. These Caterpillar tools are bringing new visibility to fatigue and generating actionable findings on the causes of fatigue. Understanding why employees are getting tired and when the operation is most at risk is helping customers better protect people and achieve higher productivity. With a focus on recent experiences from customers seeing dramatic improvements and positive outcomes, this presentation will explain how Caterpillar works with customers to address a previously invisible threat. Employees might be speaking out about fatigue; but what happens in your workplace when they do? As fatigue risk awareness increases, so do our organizational responsibilities. Leaders and supervisors are accountable for walking the precarious line between protecting employees and managing production targets. With nearly 1 in 3 workers falling asleep on the job and approximately 60% of people admitting they work through fatigue, it has never been more important to protect employees from an almost invisible risk. This webinar focuses on two factors that play a significant role in inducing and influencing fatigue: people and the environment. Using examples, Senior Safety Consultant Jenny Krasny will discuss the leader/supervisor role in detecting fatigue, how they can identify fatigue stigma and what they can do to change it. Like many companies, Madison Gas and Electric (MGE) used to gauge its safety performance solely by traditional measures – incidents and injuries. When the company committed to an aggressive journey to safety excellence leaders learned that world-class organizations measure safety differently. They look at the quantity and quality of the activities and engagements that prevent incidents. They know that error-proofing those leading indicator processes will deliver improvement in lagging measures, too. Join this event to learn how the MGE organization has involved everyone from its top leadership to front-line employees in shifting safety conversations from “what went wrong?” to “how are we going to do this right?” MGE Corporate Safety Manager Phil Nelson will join Caterpillar Senior Safety Consultant Kevin Ellison to share the step-by-step process behind the safety success story unfolding in Madison. A culture of safety excellence is easy to recognise. It’s evident in the attitudes, beliefs and actions of employees. However, achieving a culture in which every person believes the organisation and its leaders are truly committed to safety as a core value goes beyond compliance-based policies and procedures. Even where robust regulatory systems are in place, “safe” work isn’t guaranteed. Across the globe, the greatest safety performers are organisations that make an effort to understand how their safety system is perceived by the employees working closest to the risk. The feedback drives engagement exercises through which employees are actively involved in building improved processes. 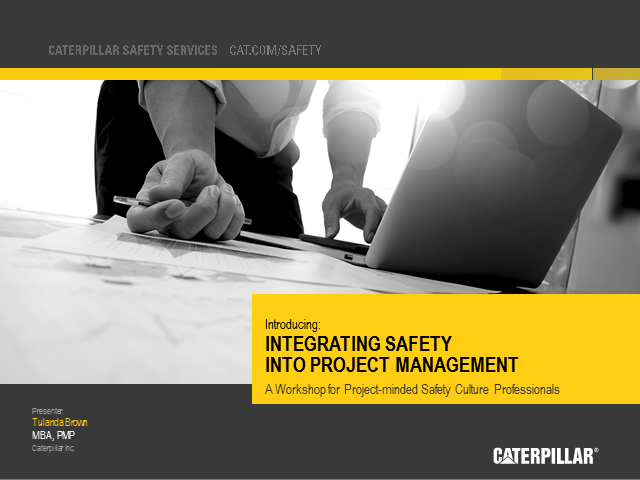 Please join Caterpillar Safety Services Asia Pacific Consultant, Jenny Krasny, as she explains tools to assess your safety culture and, how to move your organisation from policy/compliance-based safety management to safety excellence. When there’s work to be done and money to be made, you’ve probably heard the cavalier statement, “I’ll sleep when I’m dead.” Of course, everyone experiences the clutches of fatigue at some point – it’s a force of nature, after all. But it’s also an invisible threat to operations, because succumbing to fatigue is perceived as a weakness and many people don’t, or can’t, admit when they’re fatigued. As a result, many incident reports often cite “operator error, “unknown human factor” or some other ambiguous or inaccurate root cause. Measuring this invisible threat starts by asking five essential questions. Join this webinar event to learn how to determine your scope of risk, so that you can build a fatigue risk management system that reduces incidents and optimizes operations. The influence that supervisors have within an organization’s safety culture cannot be overstated. If safety excellence is the goal, empowering supervisors to leverage positive recognition on the front line is non-negotiable. Join Caterpillar Safety Services Senior Safety Consultant Jenny Krasny as she presents the final installment of a four-part webinar series on supervisor development. Learn why recognizing successful performance is the critical final step in a successful accountability strategy, and how to properly execute it. In a culture of safety excellence, safety activities aren’t just check-the-box exercises – they’re interactive, informative and preventative. Caterpillar introduces a new smartphone and tablet app to assist customers in completing walkaround inspections of equipment and job sites that truly increase the presence safety. Cat Inspect, available on Apple and Android devices as well as Windows tablets, allows you to perform timely and informed inspections of Cat and non-Cat equipment. Identify safety concerns easily and share them instantly to mitigate risk. Join David Frager, Program Manager in Caterpillar’s Equipment Management Technology & Solutions Division, to learn more about this tool to improve your safety processes. We will review the inspections forms available, show you how to perform your daily inspections, and explain how to create custom forms to meet your business needs. You’ve likely already heard, and seen first-hand, the link between sleep deprivation and workplace accidents. You probably recognise the signs of extreme tiredness (yawning, restlessness, head nodding, poor concentration, etc.) and know which policies and procedures are in place to address employees operating while tired. Yet we consistently see employees who are fatigued continue to operate, creating significant risks to themselves and others. Join Jenny Krasny as she exposes the truth about the stigma of fatigue and discusses how you could be inadvertently reinforcing a culture of shame in your workplace. Walk away from this webinar equipped with knowledge about fatigue risk, an understanding of how to assess your fatigue culture and some basic tools to make a positive difference. One of the most influential figures in the workplace is the front-line supervisor, who plays a pivotal role in determining what gets done, how it gets done and what gets ignored. Measuring supervisor safety performance, therefore, is critical to ensure the processes designed to build and sustain safety excellence are being completed in a quality way. Drawing on practical research findings, Caterpillar Safety Services Senior Consultant for Australia, Jenny Krasny, will explain the process of identifying measures that motivate supervisors to lead zero-incident performance on the front line. In 2011 Caterpillar’s North Little Rock, AR, facility, where earthmoving Motor Graders are produced, had a Recordable Injury Frequency (RIF) rate of 5.11 with 20 recordable injuries. Of 68 manufacturing facilities in the enterprise, this facility ranked number 65. When the facility leadership committed to making a change, they started by listening closely to the front-line workforce – the employees closest to the job hazards – to understand what was motivating risky behaviors. The discovery has fueled a transformational journey to safety accountability that drove the RIF rate down to 0.58 by the end of 2014. Now the facility is a safety performance benchmark for organizations inside and outside the Caterpillar enterprise. Facility Operations Manager Paul Rivera joins Justin Ganschow, the facility’s former EHS Department Supervisor (now a Caterpillar Safety Services consultant) and Todd Efird, Senior Safety Consultant, for this one-hour presentation. Where fear of reprisal exists, safety improvement is doomed. Frontline employees will not engage in safety if they believe their input will lead only to discipline or other negative repercussions. Two years ago, five of Caterpillar's re-manufacturing facilities in Corinth, MS, tackled the "fear factor" that was impeding employee involvement in safety. Through the Zero-Incident Performance (ZIP™) Process, driven by frontline-employee solutions, the facilities have achieved tremendous improvement in morale, genuine engagement and leading indicator safety performance. Roberto Ortega, Facility Manager for Caterpillar Reman Components’ Mississippi operations, joins safety culture consultant Mike Williamsen to share the case study of an organization that is no longer crippled by fear, but rather striding toward safety culture success. Ensuring supervisors are held accountable for safety is easy, making sure they have the tools to be successful is the hard part. As organisations seek to achieve a culture of safety excellence, the influence and power of supervisors in the process cannot be overstated. Join Caterpillar Safety Services Asia Pacific Regional Manager Brett Haskins as he presents the second instalment of a four-part webinar series on supervisor development. Learn how providing the right safety training to your supervisors as part of an overall accountability strategy will help them perform their role in a quality way and deliver the safety outcomes you need to see results. •Learn easy steps to engage the workforce through supervisors and best-practice success stories. Caterpillar’s formula for achieving operational excellence is driven by the Six Criteria for Safety Excellence, a four-step accountability model and tools to facilitate engagement-based safety management. Learn how these tools can be applied in any company to take good safety performance to great. Presenter Kevin Ellison led a cultural transformation at Southern California Edison’s Customer Service Business Unit before joining Caterpillar’s team of safety consultants. He will share his own experience and explain leadership’s role in successfully building commitment, accountability and involvement that drives operational and safety excellence. A major hurdle in managing fatigue and distraction is that it is often difficult to see and measure. With the advent of new fatigue detection technologies, we now have direct line of sight into the scale and source of fatigue in an operation. In-vehicle alert systems can wake a sleepy driver before an imminent crash. Data from an actigraphy band can tell you when your employees are best fit for duty. However, implementing new technologies designed to detect and predict fatigue without a thoughtful change management plan is certain to deliver less than desirable results. Caterpillar’s Fatigue Practice Manager Todd Dawson, a fatigue science expert with 20 years of experience building Fatigue Risk Management Systems, will explain a systematic approach for successful implementation of risk-mitigating technologies. Caterpillar believes in the importance of safety and we want our customers to arrive Safely home. Everyone. Every day.™ This requires safe and reliable equipment, well-trained operators, properly designed job sites and a commitment to safety throughout the organization. Wherever you are in your safety journey, Caterpillar Safety Services is committed to providing you the tools, resources and knowledge to develop a sustainable culture of safety excellence.